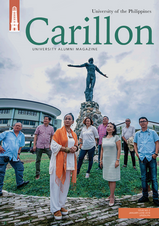 19th UPAAA convention - University of the Philippines Alumni Association in America, Inc.
of strengthening the relationship between US-based alumni and UP in their mutual quest for academic excellence and national development. 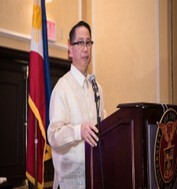 The 2019 UPAAA Convention and Grand Reunion will take place August 30-September 2, 2019 at the Crowne Plaza San Francisco Airport. 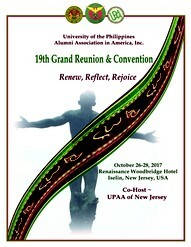 The University of the Philippines Alumni Association in America (UPAAA), with the University of the Philippines Alumni Association, New Jersey (UPAA-NJ) chapter as co-host, held its biennial 19th Grand Reunion and Convention at the Renaissance Woodbridge Hotel in Iselin, New Jersey with “Renew, Reflect, Rejoice” as its theme on October 26-28, 2017. Election of a new set of UP-AAA Executive Board officers was held on the second day of the convention. Ms. Nelsie Parrado (NJ) was re-elected to another two-year term as President. Installation of the new officers was conducted by President Concepcion. Other elected and appointed members of the UPAAA Executive Board were: Vice Presidents for the East, Midwest, South and West, Ludy Corrales (NJ), Zenaida M. Sarmiento (IL), Emma Aquino (TN), and Zenaida Ply (CA) , respectively; Secretary, Dr. Jovenia Celo (NJ); Assistant Secretary Norie Catiis (NJ); Treasurer, Gary Camacho (NJ); Assistant Treasurer, Ana Parcon (NV); Auditor, Cristy Colmenar (CA); PRO, Kellie Sabas (CA); Assistant PRO, Joe Garbanzos (CA); Historian, Luz Sapin Micabalo (NV); Parliamentarian, Lou Tancinco (CA); Liaison Officers - East, Dr. Jun David (NY); Dr. Johnny Ferrer (NJ); Midwest, Dr. Romy Aquino (MI); Roy Coloma (MI) ; South, Dr. Menchee Fulgado (FL); West, Dr. Juanita Santos Nacu (CA); Daisy Rodriguez (CA).